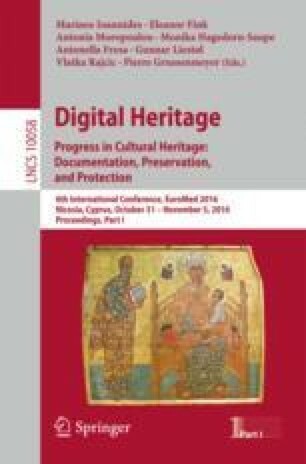 Monitoring, digitizing and archiving museum artworks represent an important socio-cultural accomplishment and an overcoming in digital preservation today. Cultural heritage is constantly under threat of terrorist attacks and natural disaster. The high costs related to documentation task have prevented a constantly and massive survey activity. The low cost 3D image based acquisition and elaboration techniques of an object, allow to carry out a 3D photorealistic model in a short time. Therefore, a lot of museum adopted these techniques for the artworks archiving. Crowdsourcing activities can significantly speed up survey and elaboration procedures. If, on the one hand, these initiatives can have a positive impact, on the other hand involve the online user with a marginal role. In this paper we demonstrate how it is appropriate thinking the museum visitor as “museum operator/maker” of the digital model overstepping the outcomes achieved so far. Authors would like to thank Marianna Marcucci, Fabrizio Todisco and Elisa Bonacini, Digital Invasions project; Giovanna Spadafora and Sandro Garrubbo, Salinas Museums in Palermo; Valentina Noto, Museo Civico Castello Ursino in Catania.